Book now the best shore excursions in Porto Cervo. High quality and safety at the lowest prices. If your are looking for Shore Excursion Porto Cervo, book now the best guided tours at lowest price with Ancora Tours. Since 2003 we offer you official guides in english, transportation and travel insurance, all included. The highest quality at the lowest rates. The beaches and the natural surroundings of the area have made the Emerald Coast one of the most coveted vacation spots in the world. Find out why with our shore excursion in Arzachena and Porto Cervo. Souvenir: Bespoke pieces of polished red coral jewelry. From the port of Olbia, the Porto Cervo shore excursion first heads to the archaeological site of Nuraghe Albucciu, 2km southeast of Arzachena. We’ll see some of the best-preserved nuraghe in the area and discover the purpose of these ancient stone structures. The site is comprised of a village of huts connected to a collective burial site; the Tomb of the Giants of Moru. Our guide will helps us to image the lives of the people who lived here many centuries ago. 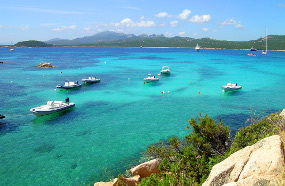 Next, the shore excursion makes the 30-minute bus journey to Porto Cervo, in the middle of the Emerald Coast. Here, we’ll have some free time to explore one of the most exclusive parts of the Mediterranean. Many celebrities and VIPs visit Porto Cervo, drawn in by the white sand beaches and exclusive facilities, such as golf clubs and luxury hotels. At the port you can admire the luxury yachts of the rich and famous, whilst in the centre of town enjoy the architecture typical of the Emerald Coast. Finally, the Porto Cervo shore excursion returns to the port of Olbia for boarding.